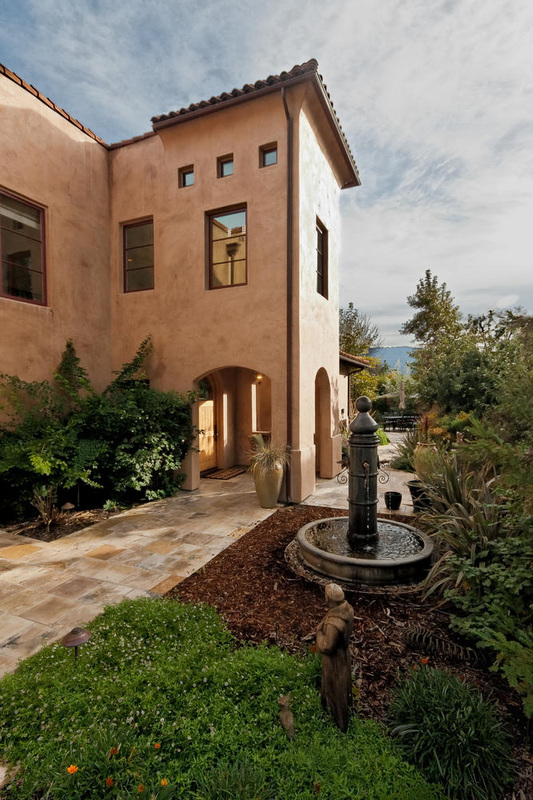 This La Amistad luxury villa is the epitome of upscale living in the heart of downtown Ojai. Designed to perfectly balance old-world charm with modern comforts, this custom home allows you to enjoy mountain views, abundant natural lighting, an array of custom touches throughout, and a beautifully landscaped, private courtyard – all just two blocks from Ojai Avenue. This ideally located Ojai home for sale allows you to enjoy the look and feel of an Italian villa from which you can take a short walk to the farmers’ market, ride your bike to your favorite coffee house, stroll through the Arcade for some boutique shopping, or wander over to Libbey Bowl for an outdoor concert or Ojai’s one-screen movie house to catch the latest release. La Amistad Villas has a total of just four units on the property, each of which is custom designed and built for maximum privacy and serenity. 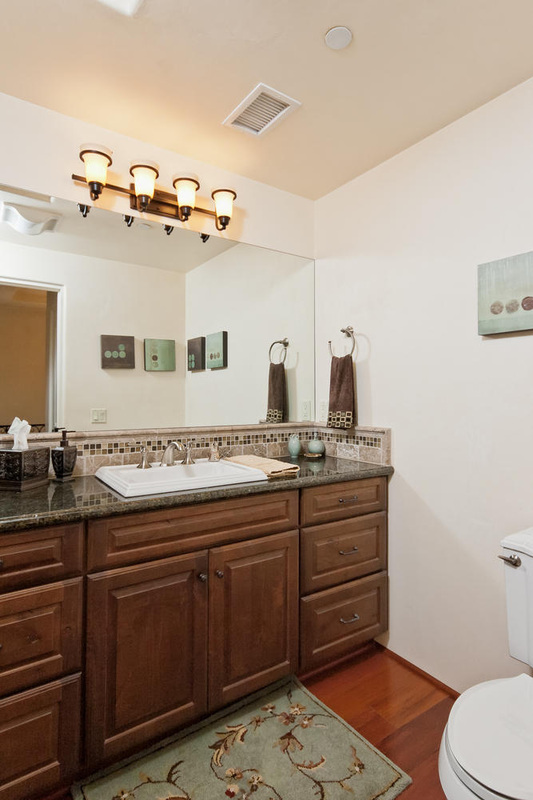 This home was the model unit; therefore, it has the upscale features common to all units, as well as custom features. Oversized, individual courtyards with stucco privacy walls and gated entries ensure that homeowners enjoy their personal retreats, while a two-car garage, covered parking alcove and additional guest parking helps to ensure that there is plenty of parking for dinner party guests and out-of-town visitors. This two-story unit has two guest bedrooms, a guest bathroom, a powder room, and an office or library with built-in cabinetry and bookshelves on the first floor. The second floor features the primary living areas, including the living room, dining area, kitchen, master bedroom, laundry room and an additional room that could be used as a yoga studio, reading nook or nursery. 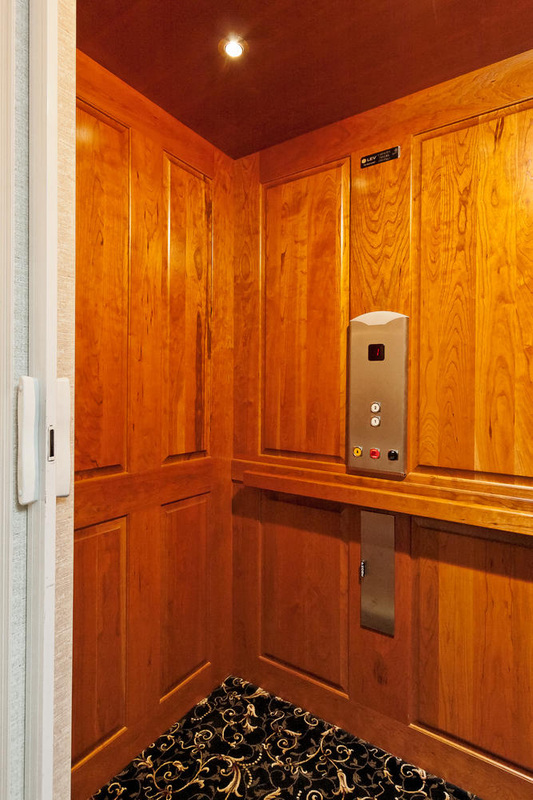 An elevator connects the two floors to allow you to fully enjoy the views and peacefulness of top floor living with the convenience of an elevator for those who prefer not using stairs. Entering your private courtyard featuring mountain views, mature trees and professionally designed landscaping with drought-tolerant plants, a slate walkway delivers you to an arched front door opening into the foyer. An open ceiling to the second floor makes this spacious entryway even more inviting, as does the custom, wrought iron chandelier. From the foyer, you can access the two spacious guest rooms, the stairs to the top-floor living area, the elevator, the guest bathroom, the powder room, and the library or office, which has built-in cabinetry with bookshelves, a desk space and file drawers. The office and each of the guest bedrooms has French doors leading to a patio, and one of the guest rooms also has a built-in cabinetry unit. The first-floor guest bathroom features a tile shower and counter top with a separate soaking tub, as well as ample storage. There is also a powder room with beautiful tiling and a granite counter top that has a door to both the foyer and the office. All of the rooms on the first floor feature acid-washed concrete floors, custom window coverings and ample natural lighting. The elevator or a beautiful staircase crafted with sustainably harvested Brazilian cherry wood and a wrought iron banister delivers you to the second floor where you will find an open floor plan, mountain views, balconies, a well-equipped kitchen and a variety of unique touches, such as an art alcove in the dining area. Sustainable Brazilian cherry wood floors are found throughout the upstairs living areas, while a ceiling of exposed, rough-hewn beams provides a rustic, romantic canopy for everyday life. In the living room, you will find a beautiful corner fireplace with a Venetian-style plaster finish, as well as arched French doors leading to the landing where you can take in the view of Ojai’s famous Chief Peak. The dining area also has a set of French doors leading to a curved landing, as well as a second set of French doors leading to a tiled balcony where you can enjoy your morning coffee or watch the Pink Moment settle over the Topa Topa Bluffs as you entertain friends or have a family barbecue. If you prefer to prepare meals indoors, you can cook while chatting with friends sitting at the breakfast bar as you enjoy the luxury of granite counter tops and stainless steel appliances, including a Sub-Zero refrigerator, and a GE Monogram oven, microwave, six-burner stove and dishwasher. A tiled wall behind the stove, a walk-in pantry with built-in shelving and drawers, and plenty of counter space for preparing meals or serving guests finish off this kitchen to provide you with both the look and function only a well-planned kitchen offers. As you walk towards the master suite on the opposite end of the second floor, you pass the elevator, a coat closet, an extra room that can be used as a reading nook, yoga studio or nursery, and the laundry room, which has a sink with a tile counter top, a tile floor and built-in cabinetry for storage. You also pass the upstairs guest bathroom, which is beautifully adorned with tile, granite and Brazilian cherry wood. Once you step into the master bedroom, you will immediately see how this space is the ideal retreat at the end of the day. A cozy, remote-controlled fireplace, an exposed beam ceiling and French doors that lead to your private balcony provide a relaxing or romantic backdrop for your personal oasis. With room for bistro seating, the balcony is the perfect place to enjoy the crisp morning air over coffee, look over your garden as you have brunch, or end the evening with a good book and a cup of tea. This resplendent retreat also has built-in cabinetry with room for your flat screen television and an arched entry to the master bathroom and extra large walk-in closet with built-in shelving and drawers. 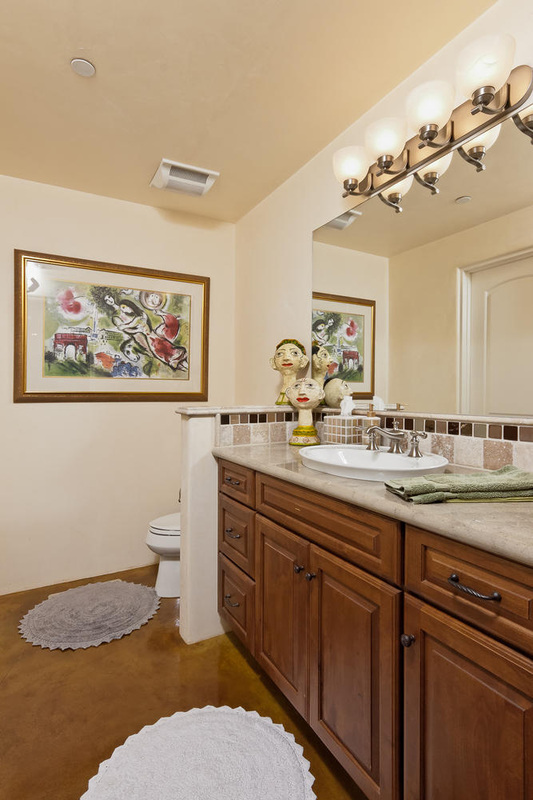 In the master bathroom, you will find a large, oval soaking tub, a separate, glass-enclosed shower, a granite counter with double sinks and a decorative tile backsplash, tile floor and abundant storage. To complete the Italian villa look and feel of this great example of luxury Ojai real estate, you will find an old-world trowel finish on the exterior stucco, Venetian-style plaster finish on all interior walls, a barrel tile roof, copper finish gutters and an array of other unique details. Once you make this villa your home, you may never want to leave. 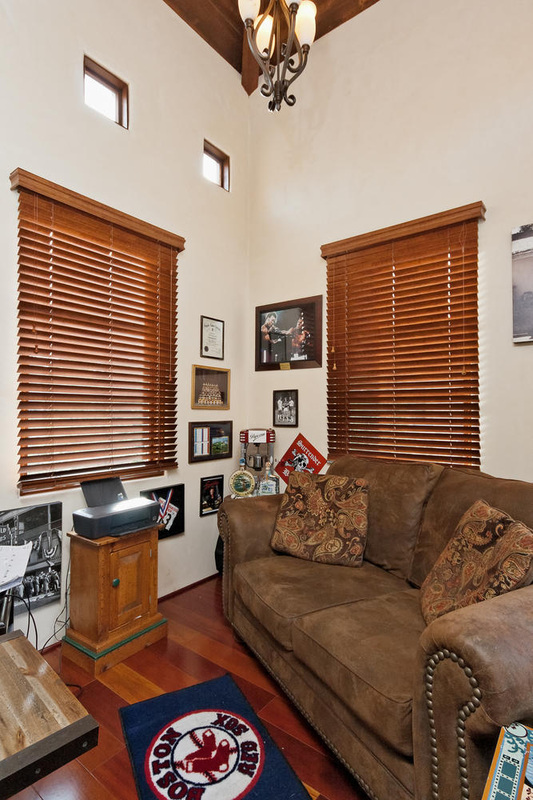 Fortunately, with Village Mixed Use zoning, it is possible to run a small business from home, which means you could truly spend both your days and nights enveloped in the relaxed luxury this home provides. Contact Nora to learn more about this property or other Ojai real estate.